In support of the Live Fearless campaign, the rock & roll nutrition show Jump with Jill is heading to five elementary schools across the Capital BlueCross footprint. 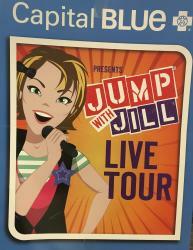 From February 4 – 6, 2019, the Jump with Jill Live Tour Presented by Capital BlueCross will rock Chambersburg Area School District, Bethlehem Area School District, and Allentown School District. The show will illustrate the power of prevention through award-winning music about healthy eating and exercise. Created by a Registered Dietitian and musician, Jump with Jill has been performed 3,500 times in six countries for over a million kids. The nationally touring show transforms nutrition education into a full-scale rock concert covering enjoying fruits and vegetables, excising to make the Beat of the Body, getting goin’ with breakfast, drinking water, and representing with calcium for strong bones, just to name a few. Shows are closed to the public, but media are encouraged to cover the live events and interview the cast of Jump with Jill onsite before or after the show.